He was only 15 when he came to America in 1903 unable to speak English. But that didn’t stop Joseph Dager from striving for the American dream. And who would have imagined that just 11 years later, Joseph Dager’s dream would be reached in the basement of a Utica, OH confectionery with an all-American product. But that’s exactly what happened when Joseph Dager sold his first batch of hand-cranked vanilla ice cream and Velvet Ice Cream was born. With Joe as chairman and his daughters running the day-to-day operations, Velvet continues to grow. The fourth generation of the Dager family, Luconda, President, and Joanne, Vice-President, continue to carry on Joseph Dager’s dream. With the help of Joseph’s sons Ed and Charlie, Velvet Ice Cream grew into a thriving business. In the 1930s, Velvet built a manufacturing plant behind the confectionery and began selling ice cream to near-by grocery stores and restaurants expanding into Columbus in 1937. Eventually this booming business outgrew its space in downtown Utica and in 1960 it was time to move. By this time, the third generation of Dager’s, Joe and Mike, were playing a major role in running the company. More than 150,000 people visit this family-fun destination every year to learn about Velvet and enjoy a delicious taste of ice cream history. Ed Dager, 2nd generation president of the company, started looking for Velvet’s new home. They found the perfect site to support Velvet’s growth on the outskirts of Utica. The site had an old gristmill built in 1817. The Dagers thought the mill was a great representation of the old-fashioned goodness and loving care that Joseph Dager put into his hand-cranked ice cream. With that, they restored the historic mill and it not only became their new headquarters, it became their trademark and appears on Velvet Ice Cream’s packaging to this date. Luconda Dager, 47, is the president of the Velvet Ice Cream Company and the fourth generation of her family to lead the Utica, Ohio-based, ice cream manufacturer. Dager oversees all aspects of the 103-year-old Velvet Ice Cream, which has 125 employees and produces and distributes more than five million gallons of ice cream each year. Before joining the family business in 1994, Dager spent three years in New York working in the retail fashion industry. She took over the reins as president of Velvet Ice Cream in 2009. Dager serves on the Board of Directors of International Dairy Foods Association; Midwest Dairy Foods Association; and The Woodward Local Food Initiative. She is also a trustee for Hervey Memorial Library in Utica, Ohio. Dager and Velvet Ice Cream are strong proponents of philanthropy, giving back tirelessly to the local community through a number of other efforts, including: hosting and supporting the annual Utica Sertoma Ice Cream Festival and promoting, raising funds for and riding in Pelotonia, which directly benefits cancer research at The Ohio State University Comprehensive Cancer Center. A frequent speaker and author in the dairy industry and on small and family business issues, Dager is also active in the Conway Center for Family Business. In 2007, she was named to the Columbus Business First “Forty Under Forty” list for influential business leaders. Dager attended St. Francis de Sales School and graduated from Newark Catholic High School in Newark, Ohio. She studied business at University of St. Frances in Ft. Wayne, IN and earned a bachelor’s degree in 1991 from Xavier University in Cincinnati. Joanne Dager, 43, is vice president for Velvet Ice Cream Company, and a member of the fourth generation of her family to lead the Utica, Ohio-based, ice cream manufacturer. In her role supervising Velvet’s food service division, Joanne leads distribution of bulk ice cream to schools, hospitals, restaurants and other large vendors. She works closely with such notable customers as Bob Evan’s Restaurants, Max & Erma’s and Frisch’s Big Boy. Joanne also oversees Velvet’s tourism destination business, managing its famed attraction, Ye Olde’ Mill, which welcomes more than 150,000 visitors a year. Ye Olde Mill houses an old-fashioned ice cream parlor, restaurant, gift shop, outdoor areas and an ice cream and milling museum, making it a popular destination for individual travelers, school, youth and corporate groups and motorcoach tours. Following graduation from Xavier University in 1995, where she earned a bachelor’s degree in communications, Dager was the general manager of Cincinnati’s Plaza 600 restaurant in Cincinnati. She worked in sales at Abbott Foods and for U.S. Foods before joining Velvet in 2004 to head up its food service division. Joseph Dager is Chairman of the Board of Directors for Velvet Ice Cream. Joe was the third generation of his family to lead the 103-year-old Utica, Ohio-based ice cream manufacturer. Joe Dager began working for his family’s company in 1950 when he was just a boy. He and his brother, Mike, helped out with production while they learned the ice cream business from the ground up. Joe took on a larger leadership role in 1959 when his uncle, Edward, became president and made Joe and Mike vice presidents. Some two decades later, Joe and Mike took over the business. Under their leadership, the company enjoyed steady growth, expanded distribution and thrived as a major local tourism destination. In 2009, Joe handed the reins of the family company over to his daughters, making his eldest, Luconda Dager, president and Joanne Dager, vice president. He now leads the company’s board, helping guide Velvet’s successful growth strategy and having set the stage for the company’s significant role in the local community. He continues to advise his daughters, supporting their leadership at Velvet Ice Cream and Ye Olde Mill. Without modern-day freezer systems, it was only natural that the Velvet Ice Company begin operation and producing the much needed ice to allow ice cream to travel. Joseph Dager begins making ice cream in the basement of a confectionary in Utica, Ohio. He started with just three flavors: Vanilla, Chocolate, and Strawberry. Charles Dager, second generation owner, helped change city ordinances so Velvet could supply product to Columbus and central Ohio. Their first distribution center opens in Bucyrus in 1937. Joe and Mike Dager (third generation) offer a helping hand in production and other parts of the business as children, learning the business from the ground up. Charles Dager died unexpectedly of heart failure. Edward Dager, second generation, brother, took over the business. Velvet relocates its manufacturing facility to the Ye Olde Mill, just one mile south of the original location. 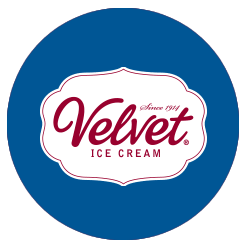 As the trademark of Velvet, the Mill appears on every package of ice cream. Renovation begins on Velvet’s Ye Olde Mill, to open as a turn of the century Ice Cream Parlor. Ye Olde Mill opens five years later in 1970. First Annual Utica Ice Cream Festival hosted by Utica Sertoma and Velvet Ice Cream. Today, nearly 30,000 people attend this festival! Velvet begins to host guided factory tours. Velvet’s Ye Olde Mill is destroyed by a fire. The Dager Family rebuilds the landmark, and reopens in the spring of 1987. Velvet redesigns the Natural Line ice cream package. Velvet’s Visitors Center opens at Ye Olde Mill for factory tours. Joseph C. Dager becomes chairman of the board. Joe’s oldest daughter, Luconda, becomes president and Joanne and Andre Dager become vice-presidents. Velvet redesigns the Premium, No Sugar Added, Churned and Pint ice cream cartons.